Most of the work we perform is traditional drilled shaft construction. We can drill 18” to 144” in diameter and up to 150’-0” deep. Slurry displaced construction methods are ideal when the geology warrants it or the groundwater level is high. We have the tankers, pumps and vacuum equipment to make the underwater concrete pour a success. Temporary or Permanent steel casings can be used to stabilize drilled shafts when the geology requires it. Our extensive inventory of steel pipe is used to keep jobs moving efficiently. Traditional drill derricks stand 55’ to 75’+ tall. Midwest Foundations has three special low clearance drill rigs that can work under 20’, 28’ or 33’ respectively. When the overburden material is poor quality we have the option to drive steel casings down to bedrock. A very useful tool to use in sandy conditions or near bodies of water. 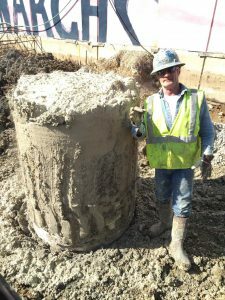 Midwest Foundations can provide turn-key tower foundations for radio, communication and transmission towers.